Richard Robinson is an award-winning photojournalist. For the past 14 years he’s worked as a press photographer for a number of our national papers, capturing memorable images of some of this country’s biggest news and sports events. 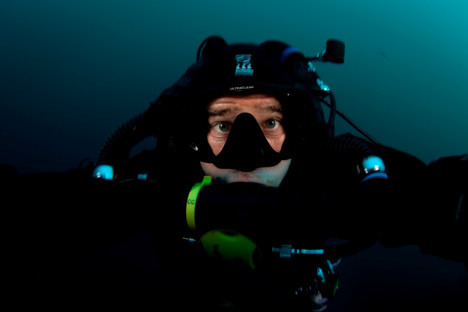 Away from the pressures of daily deadlines he has combined his love for photography with his passion for our oceans and is fast becoming known for his unique and haunting images of life below the waterline. Winner of the 2010 New Zealand Geographic Photographer of the Year Competition, Richard is a regular contributor to the magazine for the last three years, working on assignments that have taken him as far south as the subantarctic islands, to this expedition documenting New Zealand’s most northern territory, the Kermadecs. My goal is to document the Biodiscovery expedition and produce a photo-essay that will illustrate the incredible diversity of underwater life at the Kermadec Islands marine reserve and the excitement of breaking new ground in marine science. Coming from a news photography background I am a quick operator and able to adapt to fast changing situations both above and below the water. New Zealand Geographic magazine requires very different imagery from what people are used to seeing in news media—its more creative, more artful and attempts to capture the essence of the subject rather than just the subject itself. This will be my focus at the Kermadecs and I hope to return with a hard drive full of frames that will not only delight readers, but hopefully also change their perspective of the diversity, fragility and value of the underwater world. When I am not on assignment for New Zealand Geographic, or sitting in front of the computer trying to catch up on image editing, I can be found chasing big news events for the New Zealand Herald from rugby tests to court cases. (My byline graces our fish and chip wrappers the nation over). But mainly I am hatching a plan for my next dive location.